Renowned for its architecture, culture, and urban atmosphere, the Park Avenue neighborhood is transformed for one weekend each year into a one-of-a-kind shopping mecca, filled with original creations from more than 350 artists, craftspeople, and exhibitors for the Park Ave Summer Art Festival. Exhibitors set up from curb to sidewalk, and Park Avenue itself closes to vehicular traffic, filling the avenue from Alexander Street to Culver Road with festival-goers. We&apos;re sharing what you need to know before you go to the 42nd annual Park Ave Summer Art Festival this August 4-5, 2018. Shop the entire length of Rochester&apos;s Park Avenue for original creations from more than 350 artists, craftspeople, and exhibitors ranging from body care items, ceramics, glassware, jewelry, paintings, photography, sculptures, mixed media, and more. Click for a full list of artists and exhibitors with booth numbers. Arguably the best part of any festival is the food, and the Park Ave Summer Art Festival is no exception! The Park Ave Summer Art Festival offers more than 40 different festival food faves, in addition to the many bistros, cafes, bakeries, and coffee houses that call Park Avenue home. With three stages along Park Avenue, live music and entertainment are a staple of the Park Ave Summer Art Festival. 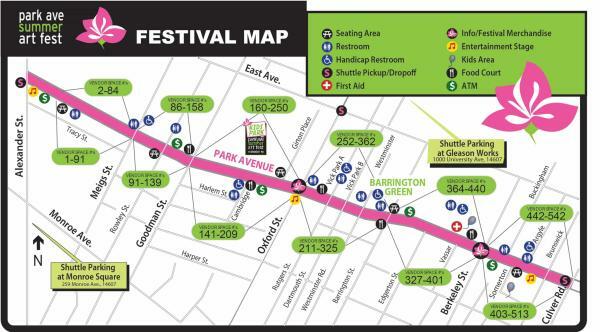 For more information on the 42nd annual Park Ave Summer Art Festival, visit www.rochesterevents.com/park-ave-festival/. And, don&apos;t forget to share your photos on Facebook, Twitter, and Instagram using #VisitROC.